Kristen Stewart has Cheated on Robert Pattinson. I have just seen a trending article on Facebook from Yahoo entertainment which states that Kristen Stewart has cheated on Robert Pattinson. 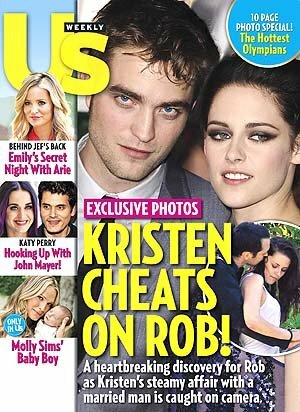 According to ‘People’ and ‘US Weekly’ Kristen cheated on Rob with Rupert Sanders- the director of Snow White and the Huntsman. The final Twilight film will be in cinemas from November 17th. Maybe Kristen and Rob will be walking the red carpet alone at the premier? I was really surpised by this, what are your thoughts? I think this whole thing is fabricated. It is Hollywood after all. But if it were true, I never thought of Kristen as the cheating on her boyfriend material. Kind of sad.